Along with technological innovations, the sports field also seems to be changing. To be more specific, a new arena emerged, and we’ve come to know this as the eSports arena. Let this sink in, eSports players like SKT Faker, TSM Bjergsen, and the like are earning as much as famous athletes like Novak Djokovic, or Michael Jordan. Apart from professional eSports players, casual gamers are also being widely popularized right now because their unique capability to be able to live-stream their games and at the same time engage with their audience. A lot of these famous “streamers” found their success on Twitch; a streaming platform that has over 15 million daily active users. When we think of gaming, PCs and gaming consoles pop up in our minds. However, the gaming market is largely composed of mobile devices such as smartphones and tablets. In fact, the mobile aspect of the gaming market has seen over 46.1 billion USD in revenue. This makes up over 42% of the total gaming revenue with almost a 20% year over year growth. One problem observed in the mobile gaming market is the scarcity of multi-player games. Over 78% of games that are currently available are only viable in single player mode. $30.3 Bn of the 46.1 billion revenue is composed of in-app purchases and advertisement revenues from multi-player mode. Although companies are already aware of this, things cannot progress further because of challenges (i.e., network latency issues and movement prediction ) that may be detrimental to a game that has already been launched. Thankfully, the “playful” (pun intended) minds behind the team of Sgame Pro provides an innovative platform to address the needs of players, publishers, influencers, and merchants alike! The players will be the main driving force that will power Sgame Pro’s success. Since the majority of mobile games are single player, Sgame Pro has developed technology that will transform these into Asynchronous Multi-player games that will pit players against each other from 1 VS. 1’s all the way up to the popular Battle Royale wherein a hundred players are put on the same battlefield. This will be the platform’s core feature called “Challenges.” They can either be public or private, depending upon the players’ preference. The platform also makes sure to match players of similar skill levels by comparing win-loss ratios. Hopefully, we will see new AI that can even detect player response times and strategy levels to make sure that newbies won’t be matched with seasoned players that are creating new accounts (otherwise known as smurf accounts.) But for now, we need to stick with the Anti-cheating feature that bans bots, automated tapping, fake users, and multiple accounts. One of the most exciting things that the platform will bring to its users is the SGM token. 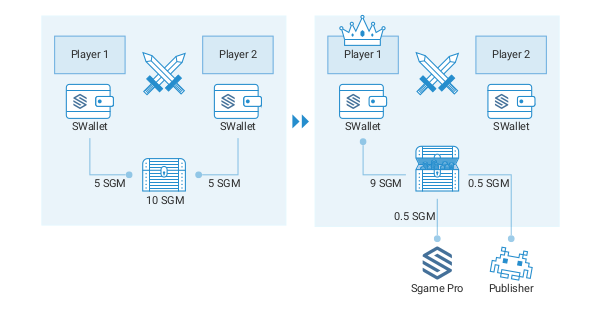 Players on the platform can (quite literally) seamlessly mine these tokens by playing games that are partnered with Sgame Pro. The time and effort spent into playing these games turn into “Proof of Play” that builds up an SGM block – similar to how blockchain works. This token can be used either to buy digital or physical goods! SGM tokens can also be converted into Ethereum which gives it even more functions. Thanks to Sgame Pro’s incentivized platform for its users, publishers may now worry less about retention and acquisition of users. Apart from that, publishers can now effortlessly market their in-game products because of the SGM tokens that users are earning. Advertising used to have an invasive and frankly annoying element. Now that players also have a portion of ad revenues, advertising will be a less disengaging activity. Publishers also share a portion of the revenue generated from Challenges so that they need not solely rely on ADV and IAP revenues alone. Influencers play a crucial role in the gaming environment because these are people that other players enjoy watching, both casually and for gameplay improvement. A lot of people built careers around gaming and influencing which Sgame Pro plans to utilize. The platform will allow influencers to monetize their follower-base by using a referral system that is beneficial to both the influencer and follower. Sgame Pro will have a “Special Offers” and “Marketplace” feature in its platform that allows Merchants to sell their products. The idea that players are loaded with SGM tokens that can be used to pay for these goods also makes it a lot easier for these merchants to expect sales. Merchants may also scale down on their online marketing costs that can be significantly expensive with high risks by given a platform that has a reach of multiple publishers. Merchants can also better target their audience because of how Sgame Pro generates high-quality user data.